This collection consists of records related to terrorism in Afghanistan from 1994 through 2001. The collection contains National Security Council (NSC) cables, emails, and Records Management System numbered documents. 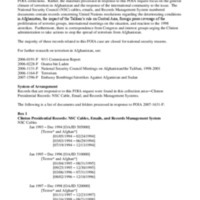 The records concern United Nations resolutions regarding the deteriorating conditions in Afghanistan, the impact of the Taliban’s rule on Central Asia, foreign press coverage of the proliferation of terrorist groups, Congressional correspondence, international meetings, and reaction to the 1998 United States airstrikes.